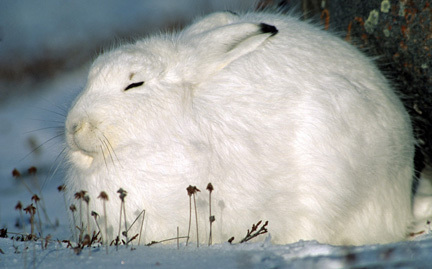 The arctic hare lives in the arctic tundra of the Arctic islands, western Newfoundland, and the coastal regions of Greenland — where ice is not present — and a portion of northern Manitoba, along Hudson Bay. The arctic hare’s diet includes woody plants, mosses, and lichens in winter; in other seasons, buds, berries, leaves, roots, and bark. It faces threats from habitat loss and climate change.